LONDON--(BUSINESS WIRE)--The global vehicle license plate market is expected to post a CAGR of over 4% during the period 2018-2022, according to the latest market research report by Technavio. However, the growth momentum of the market is expected to decelerate due to a decline in the year-over-year growth. A key factor driving the growth of the market is the increasing vehicle registrations year-on-year. Demand for passenger cars and commercial vehicles are growing in emerging countries such as Brazil, China, and India owing to the elevated purchasing power of consumers and significant economic growth. Factors such as the ongoing industrialization and global trade activity can be attributed to this growth. This market research report on the global vehicle license plate market 2018-2022 also provides an analysis of the most important trends expected to impact the market outlook during the forecast period. Technavio classifies an emerging trend as a major factor that has the potential to significantly impact the market and contribute to its growth or decline. The automotive industry has evolved with autonomous vehicles and even flying cars entering the market. The only element that has remained almost unchanged over the last century is the license plates. However, the license plates are undergoing a major transformation. “Companies such as ReviverMx launched Reviver license plate, which has the appearance of a Kindle tablet. rPlate has wireless connectivity, which can instantly update the vehicle registration, which would make updating of license plate stickers obsolete. rPlate can also be programmed to connect with smart parking apps. Services such as tolls and parking fines can also be instantly deducted from the vehicle’s owner,” says a senior analyst at Technavio for research on automotive components. This market research report segments the global vehicle license plate market by application (passenger cars and commercial vehicles) and geographical regions (APAC, EMEA, and the Americas). The passenger cars segment held the largest market share in 2017, accounting for over 77% of the market. This application segment is expected to dominate the global market throughout the forecast period. APAC led the market in 2017 with a market share of nearly 54%. This region is expected to dominate the market through 2022, with over 1% increase in market share. 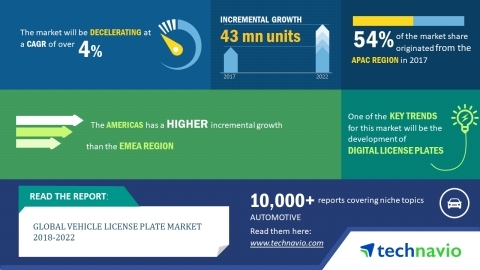 The global vehicle license plate market is expected to post a CAGR of over 4% during the period 2018-2022, according to Technavio.